First of all, this is a true story. 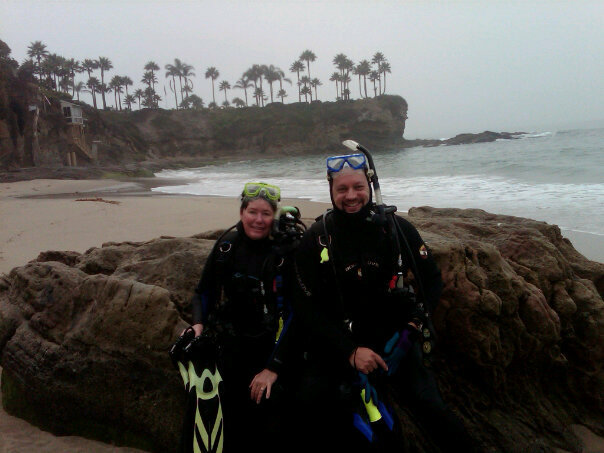 I have a witness in my dive partner Donna Sievers. For a few years, Donna and I would meet up at some point around Laguna Beach, CA every other Friday (conditions permitting). We were diehards. We'd walk to a place where we could check the waves, make our decision whether to go out and then suit up and get in. If we actually made it to the location by 7:00, we were usually in the water by 7:30. I've made almost 100 dives in my life. Over 80 of them were with Donna. She was the best dive partner I've ever had and I'm only speaking in the past tense because she abandoned me and moved to Hawaii. There she posts dive pictures and photos of spectacular sunsets on Facebook in an attempt to make me jealous. It works, but I digress. When I say we met every other Friday, I mean it. It didn't have to be a sunny day or even a warm day. We did as many winter dives as we did summer ones, maybe even more. The Pacific is cold anyway so there were actually days when getting in the water felt better than being out of it. The day we found the dead man, it was overcast as in the picture above. There was a fog that wouldn't burn off until later that day and our official photographer, Debbie Sullivan, wished us a fun dive while she hung back on the shore drinking coffee and patiently waiting for us to get back. We were at Crescent Bay and conditions were just about perfect to make a dive on my favorite location in Laguna, Deadman's Reef. The picture above is a 3D rendering of the reef that lies below the surface. Deadman's Reef is a large patch of rock that juts up from the bottom and comes about ten feet or so from breaking the surface. 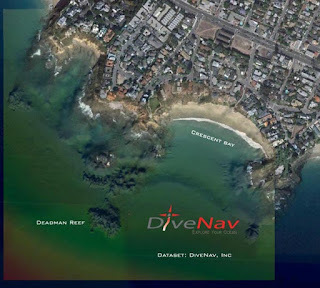 On the side closest to shore, the depth is around 30 - 40 feet depending on the tide. As you head around the back side you'll find yourself in 40 - 50 feet of water and there's a good chance you'll see big animals like seals and sea lions as well as colorful small ones like the Spanish Shawl Nudibranchs who loved one particular section of rock. As you can see though, it's a bit of a haul to get out to Deadman's. When we first started diving there I asked about where the name came from and I was told it was because boat traffic in the area had caused a death or two from divers who'd surfaced in the wrong place at the wrong time. In my experience there, I never saw a lot of boat traffic, but when I dove there and had to surface for some reason, it was something that stuck in my head. Donna and I had swimming out to Deadman's Reef down to a science though. We would hug the protected reef area as we swam on the surface. Then we'd align ourselves with a certain house on one of the cliffs and kick straight out until we were about 150 yards or more from the shore. Then we'd drop down and be within easy reach of Deadman's without using a lot of air. That method also kept us out of any potential boat path for the most part. Usually, I would bring my underwater camera with me on almost every dive. There came a point though when I decided not to any longer. I found I was spending more time fooling with my camera than enjoying the dive and on this particular day, I left it at home. So of course, this would be the day that we saw something I'll never forget. Donna and I began our dive by circling the base of the reef. The visibility wasn't the best. Like I said, I don't have any photos from under the surface that day, but here's one from a different dive that shows how murky the water can be here on what we call a "good day". As I remember it, the day we saw the dead man was about like this. If you're lucky you get about thirty feet of visibility. It takes some getting used to for those that are more familiar with diving in the Caribbean or somewhere the water is pristine. You spend a lot of time looking around wondering just what may be out beyond your sight line. We had spent about forty minutes on the reef and had gone around the base once when Donna suddenly pointed to our right. At first my brain couldn't process what I was seeing. It wasn't a nudibranch but it was colored a weird black and aqua. Slowly my eyes adjusted and I realized it was a hand. A gloved hand was sitting immobile and raised just a foot or so off the bottom of the ocean floor. The hair on my arms stood up under my neoprene wetsuit and a crawling fear climbed into my stomach. What had we just stumbled on? Did someone do a solo dive out here and get in a jam? Donna and I swam closer and then I made out an air tank and feet with fins attached. It was definitely a body and there were no air bubbles rising to the surface. Whoever this guy was, he was dead. Or was he? I started thinking back to my rescue training and wondered if we could get him to the surface and administer rescue breaths. Maybe he'd only just now succumbed to whatever it was. That's when I saw the coffin. That's right. A coffin. What the hell was this? A weird mafia hit? Did someone get rid of an enemy here at my favorite dive spot? Wait a minute. That coffin looked a little thin to be holding a body. And the air tank was actually fused into the lid. It was at that point that I realized what I was looking at was a piece of underwater art. As soon as I got home, I sketched what I'd seen. Here's what I drew. Apologies for not being much of an artist. I can't express the relief that flooded through my body. As we examined it closer, we found the fins were strapped on with metal stirrups and the gloves were simply fastened to the sides of the concrete coffin. I immediately began mentally kicking myself for leaving my camera behind. 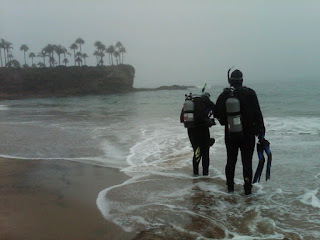 After that dive we had a string of weekends where the conditions weren't good enough to dive at Deadman's. The next time we went out, I brought my camera but the coffin had already been overtaken by kelp and anemones. You could barely even make out the shape. The ocean claims things very quickly around here. Still, I'm glad that I got to see the dead man in pristine condition. Sure it scared me enough that I almost soiled my wetsuit, but it's something I'll never forget. If you are in the mood for something scarier than a story about an art installation on a California reef, why not check out my book The Wash? Or maybe my short story A Debt to the Dead? You can find links to both on my author page at Amazon. Until next time, have a safe and happy Halloween! This wasn't supposed to be the post for today. I'd actually written up something completely different. Then we went to the neighborhood pool at night and I met The Kid. You know the one. You've seen him or her in grocery stores, the kitchen section of Target, or in line at the bank (although admittedly, nobody goes to the bank anymore). It's that one kid who's bored out of his/her skull and is looking for someone, anyone to interact with. They're usually cute and precocious and their parents have completely had enough of them. That was the case tonight. My wife, daughter and I are all hanging out in the jacuzzi, when in the gate comes a mother, a grandmother, a three year old girl and The Kid. The Kid is in first grade. He's blonde. His mother calls him "imaginative" and he comes right over to us and introduces himself without anyone asking him to. The world is a wonder to him and it's full of nothing but friends. I used to be that kid. Maybe that's why, when all the adults started talking about school and homework and vacations, I started paying attention to what The Kid was saying because let's be clear. He started talking from the moment he came in the gate until the moment he left. It was a running dialogue that was meant for everyone and no one in particular. The first thing that caught my attention was the word "monster". I mean, it's not a word used in common conversation by most people over the age of 10, so it grabbed me by the ear. "And when you see him, you have to run over and tell your neighbors because he's really spooky." That's what I heard after the word "monster". Now, everyone in this hot tub was ignoring The Kid. Hell, I'd been ignoring The Kid. However, about a thousand hours of horror movie watching have taught me a thing or two over the years. One of those things is to listen to the person no one else is listening to. "What monster is that?" I asked. The kid's expression didn't change. He didn't brighten up or become more engaged. He just looked my way and continued. "He's really spooky and he rises up out of the water like this and then he does this." This got his mother's attention. She looked over and apologized to me. Then she literally asked him "Is that your best behavior?" He looked down and replied, "No." Then she went back to talking to my wife and The Kid's eyes drifted back to me. He continued. "You have to watch out for him. He likes to stay in the hot tub because it's warm but he comes out when everyone is asleep and then he comes in your house and makes that sound." "The howling sound?" I asked. "Yeah, just like I did." "Is there anything else I should know?" "Yeah, he has a red blanket." "My wife has a red blanket," I said. "He has a red blanket and he's really spooky." "I should be careful then. Maybe it's her." I nodded toward my wife. He looked at her and then back to me. "Yeah, you probably should," he said solemnly. So yeah. It's 9:00 p.m. and I'm headed to bed here shortly. I'll probably read a little before I fall asleep but I'll also be wearing my crucifix and maybe sprinkling some holy water down the middle of the king sized mattress because let's face it, not too many people have red blankets. Want to read something creepy? Head over to my Amazon authors page and check out my novel The Wash or my short story A Debt to the Dead. They'll scratch your itch for you. When I think back on the three years I wrote for DVDinmypants.com, one assignment stands far above all the rest. I was privileged to be paired with a writer named Shawn McLoughlin and we were asked to review about twenty Universal Monster films that had just come out in box sets. Almost every film featuring the classic characters The Wolfman, Dracula, Frankenstein's Monster, The Mummy, The Invisible Man and The Creature From The Black Lagoon was included. It was a daunting task but there may be no series of films I love more than those original black and white Universal monster movies. Having to pore through those titles to review them rekindled my love for those monsters and renewed my obsession with my hands down favorite, The Gill Man. Personally, I believe The Creature From The Black Lagoon is the perfect monster movie. Even though it's over 60 years old, it can still provoke scares out of people who have never seen it before. Scenes have been quoted (sometimes verbally and sometimes cinematically) in blockbuster films that came years later. The most famous is the 'underwater ballet' scene between the Gill Man and Julie Adams that directly influenced Spielberg's opening attack sequence in JAWS. It's got a great script, fantastic acting and effects that were ahead of its time. So in order to honor my favorite monster movie, here's a list of five little known facts you can pull out to impress people. However I should warn you that you will come off looking like a super nerd if you actually attempt to break these out at parties. 1. The film is based off a real myth. It's true. The movie was inspired by a tale from South America about a village that was tormented by a half-man/half-fish monster. The creature demanded a woman as tribute every so often. No one really knows what he did with them, but apparently they didn't last long. You know, the saying goes that there is some truth to every myth. Perhaps an expedition is in order? 2. Orson Welles was involved in the film's genesis. How he was involved with the Gill-Man is almost a six degrees of separation game, only there's just three degrees. 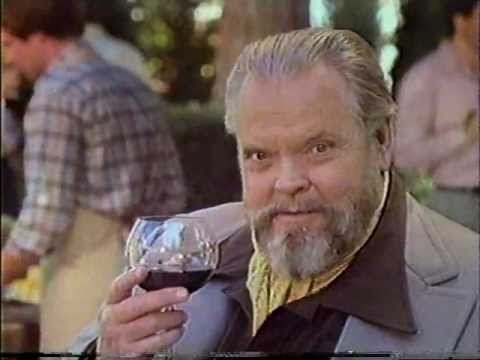 Welles was at a Hollywood party and he happened to be talking to Mexican cinematographer Gabriel Figueroa. Figueroa recounted the fish-man story I mentioned above and the conversation was overheard by William Alland. Alland eventually thought back to that conversation and used the myth as the basis for the original script. Many, many drafts later it made it to the big screen with no further help from Welles. Still, if he hadn't had that party I wouldn't have my favorite movie of all time, so I give credit where credit is due. 3. 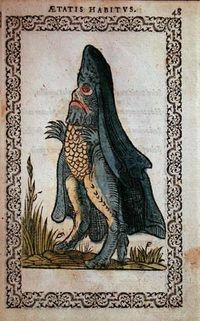 The head of the creature was designed after a seventeenth century woodcut of a creature called The Sea Bishop. That picture says it all, right? Well, not quite. As the story goes the creature was first discovered in the Baltic Sea in 1433. It was presented to the King of Poland who was so fascinated by it that he decided to keep it instead of releasing it back into the water. It was described as having a fin that looked like a clergyman's cloak and a head that was humanoid and shaped like a bishop's mitre. A group of actual bishops were granted an audience with the strange creature who apparently made gestures to them that it wanted to go back to the sea. The bishops convinced the king to let it go and when it was put back in the water, it made the sign of the cross and then swam down into the depths. Of course, then it made its way to the Amazon River, terrorized Julie Adams and company and spawned two sequels. Somewhere along the way, it must have lost its faith but who could blame him? It was Julie Adams, for crying out loud! 4. There was no air tank in the Gill Man costume. For the original film, Ricou Browning (who played the Gill Man in all of the underwater scenes) had to hold his breath, sometimes for up to four minutes. 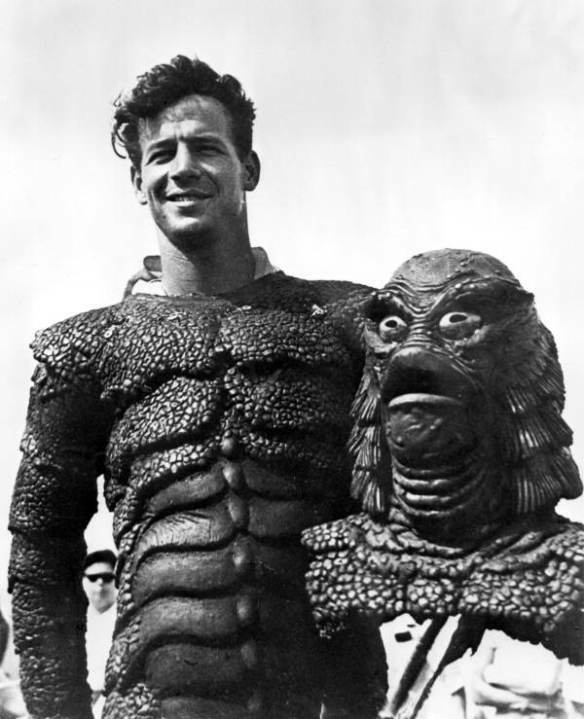 The director wanted the creature to look real and since the monster had gills, he thought that having bubbles escape the costume would ruin the effect. Lucky for him, Browning was a professional swimmer and diver. In fact, Browning had never aspired to be an actor. He was a behind the scenes guy and went on to do some fantastic directing work including all of the underwater battle scenes in the James Bond classic Thunderball. 5. There really is a Creature From The Black Lagoon! The picture above isn't it though supposedly it looks similar. Actually, it's an amphibious fossil that was discovered by Jennifer Clack at the East Kirkton Quarry near Edinburgh. Clack named it eucritta melanolimnetes which literally translates into "creature from the black lagoon". It existed during the Visean epoch of the Carboniferous period of Scotland. Clack noted that the fossil was discovered in what was once a 'fetid swamp', so the name fit perfectly. And there you have it. 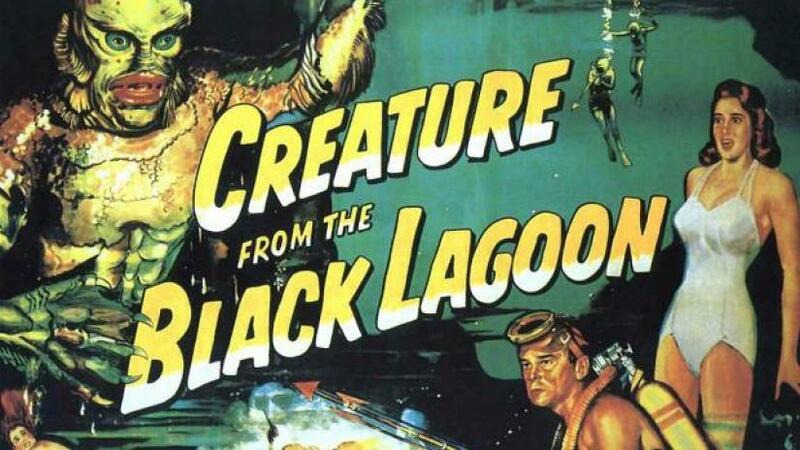 Five fun facts about The Creature From The Black Lagoon that will get you absolutely nowhere in life. However it did distract you from doing work, so at least that's something, right? Oh, and hey! 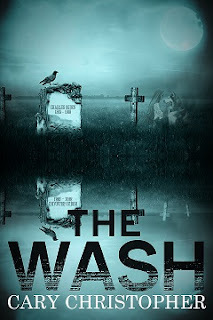 If you're a horror fan and are looking for a good read, why not check out my book The Wash available exclusively on Amazon! Five Bands Vol. 3 - Halloween Music!! It's been a long time since I did a music post and there's no better time to put together a "Five Bands" list than October. There are a ton of great bands out there who choose to adopt horror imagery for their album covers, videos or general attire, but there are far less who actually make genuinely creepy music. So don't get upset if you don't see your favorites like Oingo Boingo, Rob Zombie, Alice Cooper or The Cramps on here. We're going to go a little off the beaten path to see what we can find. I found out about these guys in the best possible place you could: Count Orlok's Nightmare Gallery in Salem, MA! As we wandered among the wax figures from some of our favorite horror films, my wife and I kept commenting on how cool the music was. Finally, I couldn't stand it any longer and asked one of the attendants. This is the music you want playing on the front porch as the kids come up for candy. It's creepy music written specifically to scare. These guys have a number of albums out and almost every track is perfect to be played on Halloween night. Definitely check them out! With a name like this, you probably expect a super heavy, Black Metal band. You'd be so, so wrong. This French band creates classically inspired songs about death, cemeteries and all things gothic. In fact, think of them as goth opera. The music is as cold and stark as winter snow on a marble headstone. Now the rough part about this band for many here in the States is that their songs are sung in French. For my Canadian brethren, this may not pose a problem at all (Susan Tate, I'm looking at you). For the rest of us, it's well worth your time to look up a translation or two if you want to get creeped out. For instance, take the lyrics to the song "Reve Mortuaire" which translates to Mortuary Dream. Sleep, sleep, little angel, sleep and dream of me. See what I mean? This stuff is Dark with a capital "D". Okay, enough with this classical/electronic music stuff. We want some roots based Halloween music! Well, look no further than The Pine Hill Haints. This band hails from Alabama and describes what they do as "Alabama ghost music". Expect traditional instruments like mandolin, guitar, washboard and even accordion on occasion. My favorite though is when the "singing saw" comes out. Their lyrics run the gamut from ghostly trains to wanting to be a "Jack O'Fire" as in the clip above. This band gets played on my iPod year round. So you don't want something as classy as the first two but you don't want traditional roots music either? It's time for an American icon: Dr. John. There may be no cooler man alive than Dr. John. A New Orleans jazz giant if ever there was one, Dr. John's voodoo/rootwork imagery goes beyond just the way he carries himself. If you listen to the lyrics of the song above (Walk on Gilded Splinters), you'll hear him referencing all kinds of folk magic terms as he sings about putting the hex on his enemies and wonders aloud, "Did I murder?" His album Gris-Gris is a marvelous concoction of blues, jazz and voodoo imagery. I highly, highly recommend this! So I lied. Of course The Cramps are going to be on this list. I'm not sure there's another band out there who captures the fun, the goofy and the dangerous side of Halloween better than The Cramps. Above is a link to a live version of "TV Set". It's an uplifting song about how lead singer, Lux Interior, is going to cut you up and use your body parts as accessories for different appliances around his house. It's actually a very funny song despite the grotesque imagery. Unfortunately, Lux died during a show in 2009. His wife, Poison Ivy (the red-haired guitarist seen on the right of the stage), rightfully decided that the band could not go on without him. Even though The Cramps are no more, you can still access the entire concert above right at this link. If you decide to search further though, just be aware that you may come across Lux wearing fishnets, heels and electrical tape while performing. Pushing boundaries was one of the guiding forces behind this band, but that's for another music post at another time. For now, that's it for this Five Bands post. Let me know what your favorite "Halloween" bands are! P.S. After writing this post, the first album I put on was Dr. John's Gris-Gris. Just sayin'! Don't forget you can pick up my novel The Wash either as an ebook for Kindle or one of those old timey paper versions exclusively at Amazon! Well, here it is, at least in ebook form. My new novel, The Wash, is now available exclusively through Amazon and I couldn't be more excited to share it. If you're not an ebook person, no worries. The physical copy will be available by the end of the month and I'll definitely announce that here as well. You know, one of the things I'm most fascinated by is "the story behind the story". I love reading about what inspired an artist to create a song, a director/writer to produce a movie or an author to create a novel. That's probably why I read so many musician biographies. For me, that moment of inspiration is my favorite part of the creative process. When it hits I get obsessive about capturing whatever it is that's lit a fire under me. My novel, The Wash, is a horror novel about a small town in Utah, where a few ne'er do wells have woken up something very old and evil. The pieces that led up to it rolled around in my head for over a year before I had the urge to put fingers to keyboard and when I did, I thought I was writing just another short story. Boy, was I wrong! Here's how the pieces came together. About ten years ago or so, my wife, daughter and I met up with my parents in Utah. They'd rented a timeshare up on Brian Head, a popular ski resort. Now, I should tell you up front, my wife and I have skied fewer times than you can count on one hand and my parents rented this place in early April. Our thinking was it would be spring and we'd visit some national parks and see more of the country. However, when we got there we found the resort was still open and there was a ton of snow on the ground at that elevation. Even at the base of the mountain there were patches here and there and a very large lake near Panguitch was still iced over. My wife and I did end up skiing one day but mostly our entire group did exactly what we planned. We all got in a car and explored the area as thoroughly as possible. Every day we headed off in a new direction. I was absolutely captivated by the beauty and also by how remote some of the places we visited were. Heading down the side of the mountain towards Panguitch, we found that if we turned left when we got to the highway, we could drive for miles and miles and only see a random store or farm here and there. Otherwise, it was just empty land for as far as the eye could see. At one point, we stopped at a small store that was literally the only structure within view. I went inside to get coffee and the cashier talked to me for probably ten minutes. It was obvious she was grateful that someone had stopped. I remember thinking to myself, "What would happen if someone walked in and robbed this place? Who would come out to help? Where is the local police station?" Those are all thoughts that go through the mind of someone who lives in a big city and is suddenly in a rural area. When I lived in small towns in Florida, I never thought about that. That store and the memory of that small conversation over a cup of burned coffee became the seed for the town of Ogden Wash in my novel. I didn't know it at the time though. I didn't even really have a plot in mind, just a location. A few days later we were leaving to go back to California and we went down the other side of the mountain from Panguitch. Passing through a small town, I caught a glimpse of a cemetery that was one of the most beautiful I'd seen. I'm not really a cemetery guy either. I don't do headstone rubbings or anything like that. However, this place was small and had a stone wall that stood about four feet high and went around the entire plot of land. There was an iron gate in the front. From the size of the markers I could tell they were old and obviously dedicated to people who had helped found the town. For whatever reason it stuck in my head, but at this point I still didn't have a story in mind. I just had a picture in my head of this quaint cemetery and wondered if anyone was still being buried there or if it was full. When we got back from that vacation, I picked up the book Under the Banner of Heaven by Jon Krakauer. If you haven't read anything by him before, you're truly missing out. He's hands down one of my favorite authors and this book was fascinating. It is a nonfiction account of the history of the Mormon faith. In it, Krakauer discusses faith in general and explores all the different facets of Mormonism. He explores the fringe sects who broke away from the church for one reason or another and he discusses the main body of the church and how they have evolved over the years. His tone is always respectful, even when he's digging into unsavory topics. I didn't know it at the time, but I'd met one of my most mysterious and conflicted characters somewhere in those pages. Fast forward to a year or so later when I received a disc from Netflix in the mail. The movie was a relatively obscure horror title from 1973 called The Iron Rose. It's by a French director named Jean Rollin whose work I'd never really explored but his films had been recommended to me by another writer who did movie reviews on a site I wrote for at the time. In the movie, a young couple on a late night walk wander into a large cemetery and then realize that they can't find their way out. No matter what they do, they can't seem to escape the place. It's pretty low budget, but has a creepy atmosphere and a pretty dark ending. It stuck with me and I started getting this idea for a short story. I wanted to write about a cemetery that was alive. It was a place that had been used a century before and it craved the attention it received with each memorial service but now it was full. No one came around anymore and it was hungry for bodies. Immediately, I thought of that small cemetery in Utah with it's stone wall, tall headstones and iron gate. The very next morning, I sat down at my computer and started trying to get the story out of my head. The more I typed, the further away the ending seemed to get. My character, Robert Jiminez, was leaving work late at night. He was heading home and it was bitterly cold. He was on a bike but the tires had gone flat and he was half-walking, half-running in order to make it to the cemetery wall. There, he could duck out of the wind and try to warm up before the last mile or so to his house. Robert passed the convenience store I'd been to. He passed a used car lot owned by some guy named Anderson who he didn't know a lot about other than he and his family were Mormon and lived just outside of town. I'd gotten Robert about halfway to the cemetery when something happened and my fingers typed some words I hadn't intended. Instead of making it to the graveyard, Robert tripped over a body in the road. I stopped writing right there. I didn't know what to do. I liked what I'd written but didn't know where it was going anymore. I mulled it over for a week and the next Sunday, I picked up the narrative with Robert tangled up in his bicycle and the body laying next to him. Instead of finding a resolution, Robert kept getting more wrapped up in a mystery that I didn't even know was unfolding in this town until I wrote it. I met his friends, Javier Quintana and J.B. Youngblood. They seemed like cool people. I met Bethany Ann, who owned that convenience store and I met Phillip Anderson who ran that car lot. All of them met Ruth Biden who was more or less modeled after my own grandmother and who was just as headstrong and feisty when she had to be (or sometimes just when she felt like it). The further I dug, the more my characters introduced me to other residents of Ogden Wash and over time, some of them started changing. People I initially liked became despicable. Others died horrible deaths that I never set out to give them, but sometimes you have to do what's right for the story. That initial tale of Robert's trip home ended up being the middle of a much larger story. It's still in the finished book, but the hungry cemetery is gone and replaced by something even older, meaner and more deadly. I've never gone back to actually visit that part of Utah again, but the town of Ogden Wash was very real to me when I was writing that book and in some ways it still is. There came a point when I realized this whole other world in my head needed to be mapped out, so I did. I drew out the entire town, placed that convenience store and the used car lot on the edge, made sure that my character's houses and places of business were noted and placed that damned "Old Ogden Wash" ghost town way out on the perimeter. There's a big piece of me that hopes one day I'll drive that highway and find there's a real Ogden Wash just like in my book. I just hope to visit before the nasty stuff starts. I hope you check out The Wash, but more importantly I hope you enjoy it. Even if you don't, please take five minutes and leave a quick review on Amazon. Your feedback allows me an opportunity to get this book out to a wider audience of people and really, that's what is important to me. I wrote The Wash because I had a tale to tell and to completely mangle a Kevn Kinney lyric, 'a story never shared is not a story at all'. Thanks for reading this very long post. I promise to get back to horror movies, music and/or stupid jokes next time around. As I mentioned when I restarted this blog a couple of weeks ago, I've got a book coming out very soon. The ebook version should be out next week and the physical copy is running a little behind but should be available by the end of the month. A handful of people who read this blog have read an early version of that book. It's gone through a ton of changes since that early draft but the one thing that didn't change was the short story that started it all. See, I never sat down and thought, "I'm going to write a novel." Actually, I sat down and said, "I'm going to write a short story." That short story got to about 10,000 words and then I said, "I think I may have underestimated things a bit." I tend to believe that I picked up that underestimating trait from my stepfather whose gauge for how long things will take may possibly be the worst in history. He's notorious for saying something will take an hour or two and the next thing you know your entire day is shot. The most famous example of this within our family is the time he pulled my brother and I aside about four in the afternoon on a Saturday and said, "Hey, come help me put this mountain stone up on the side of the house." I had a date that night and needed to leave by six. My brother had plans also. We both told him that it was pointless to get started because there wasn't enough time before we'd have to leave. He insisted that it was going to be "easy" and we'd have it done in no time. We may have gotten four pieces of stone up before we abandoned him. Despite showering, I went to pick up my date with pieces of concrete stuck under my fingernails. My brother's revenge was that he wore a pair of my stepfather's shoes while helping so they got concrete all over them and were ruined. What you really need to know though is that mountain stone job took six months to complete. Now granted, some of that was due to my brother and I quickly leaving as soon as we saw my stepdad showing any signs of motivation about working on that again. Still though, it wasn't a job that was going to be completed in a couple of hours. What does this have to do with inspiration? Well, nothing actually. See, I got sidetracked by talking about poor time management instead. I suppose there's a lesson to be learned somewhere in all this but don't plan on me learning it anytime soon. Next time I'll tell you a little about where the original idea for The Wash came from and hopefully point you to where you can get a copy. Until then, have a great weekend! The Halloween movie watching continues and last week, we watched an extremely divisive one. A couple of things you need to know up front. 1. My daughter is obsessed with all things Asian right now. Earlier this year I came back from the 24 Hour Film Fest in Boston and I was raving about this film. Since it's Korean, she was the one who put it on the list of things to watch this year. 2. I sold my daughter on it based on the fact that there is a Korean boy’s baseball team on the train and they are all around her age. She was (very openly) hoping for some eye candy. What I didn't tell her was that the whole damn team is dead in the first 20 minutes except for one boy and one girl. Yes, I fully admit this was a horrible thing to do, but what's done is done. The simple fact is Train to Busan is a great movie and I knew I'd probably have trouble getting them to watch it unless I offered up some temptation. It's one of those horror films that starts slow, ramps up quickly and then never lets up until the credits roll. Even with the deaths of the baseball team, my two viewing companions hung in there for a long time, but with about a third of the movie left, the bitching began. Wife: This is way too tense. I can’t take it. I'm going to hang out in the dining room. Daughter: Aaagh! They killed the only cute Korean boy left. That’s it. I’m done with this! And once the credits rolled, the complaining didn’t let up. Both: I can’t believe you made us watch that! Me: I didn’t “make” you watch it. You wanted to watch it. You told me to put it on the list! Daughter: But that’s because you said it had cute Korean boys in it! Daughter: But you killed them! Me: I didn’t kill them! The zombies killed them. This went on for days. Literally. Days! We watched it a week ago on Saturday and I was still getting comments about it yesterday. The fact is though, Train to Busan is a great horror film. Even amidst the complaining, there were grudging acknowledgements about this. My wife repeatedly said that she cared about the characters and that the script was well written. She and my daughter both talked about how real the zombies were and how tense the movie was. If gory, scary films are your thing, this one is highly recommended. At least it's recommended by me. I can't speak for the others in the house. Other films we watched in the last week. Now, I didn't know Tom Petty. I never had the pleasure of meeting him. I only knew him through his music, but that music meant so, so much to me throughout my life. Growing up in Florida in the 1970's and 80's, being a fan of rock music meant listening to the songs of "others". Those "others" were from places like New York, Detroit, Los Angeles, London and Liverpool. Those were the places where the rock and roll "scenes" were legendary and I was/am a fan of all of them. In Florida at that time, we had no scene. The closest we'd come was around the time Lynyrd Skynyrd took that fateful plane ride and the remnants of the southern rock scene they helped spawn were bands like Molly Hatchet, .38 Special and Blackfoot. They were good bands but they weren't "rock bands". They were "Southern Rock" bands. To someone like me who was gravitating to punk and heavy metal music and didn't particularly like country those bands didn't really do much for me. But what I did have was Tom Petty & the Heartbreakers. They were real rock and roll and they had sprung up from Gainesville, Florida. Sure, they'd moved to L.A. (to be closer to that "scene" we were lacking back home), but the great thing about Tom Petty was he never forgot where he came from. If you were from Florida or the South in general, he left you little clues in his songs that let you know he was still one of you. Probably the best example for me personally is in the song "American Girl". The first time I heard it, I was thirteen years old and listening on my Sony Walkman to a radio station out of West Palm Beach (99 WIZD - "The Wizard"). It was after nine on a school night and I was listening in bed when I should have been asleep. "She could see the cars roll by out on 441, like waves crashing on the beach." There was only one 441, HWY 441, which went right through the middle of the town I lived in and was only a couple of miles or so from my house at the time. Where other artists' songs were speaking about love or heartache in a more generic way, Tom Petty had just sung a song that was about the place where I was living. That "American Girl" could have been sitting next to me at school for all I knew and her longing for something different and better was the same as mine. A lot of Petty's songs spoke to me like that. The lyrics about "spanish moss" and being a "landlord and a renter" in the song "Down South" stood out like neon lights to me the first time I heard them. "Southern Accents" can bring me to tears to this day with its tale of a southern man lost in the modern world. Later, when I moved to California myself, other songs took on new meaning as I suddenly had a visual for places like "Mulholland", "Reseda" and "Ventura Boulevard". It all became personal again and maybe that's because I'd unwittingly just followed in his footsteps from one side of the country to the other. Either way, the fact remains that his music touched me in a way that very few other artists' work has ever touched me. As I said above, I didn't know Tom Petty, but he sure as hell knew me. That's why this one hurts more. I've gone back and forth about whether to write this or not. I mean, let's face it. Monday was a horrible, horrible day. No matter what side of the political spectrum you fall on, yesterday sucked and no amount of screaming at each other is going to make it better. I'm not going to use this blog to talk about gun control or the senseless loss of life. There's enough about that already. I'm not going to use this blog to talk about my political views right now. I fall squarely on the left and think that "Liberal" and "Patriot" are two words that are not mutually exclusive. That should tell you whatever you need to know. All I'm going to do is just ask anyone who's reading this to just stop. Stop whatever you're doing right now (or avoiding doing since you're reading this blog). Stop forwarding inflammatory e-mails. Stop sharing partisan Facebook posts. Stop yelling at the top of your internet voice about the horrors of the other side's viewpoint. And once you've stopped, start "Being". Be the person who listens to the other sides' viewpoint. Be the person who looks for common ground in order to move the discussion forward. Our country is tearing itself apart from the inside right now. I've seen posts from people who say, "It would be better to let it all crumble down and start over." I don't agree. I hope you don't either. It's not too late. Patrick Henry, an American patriot, said in his last public speech, "United we stand. Divided we fall. Let us not split into factions which must destroy that union upon which our existence hangs." We're falling now, but we can still catch ourselves. We can be the America we're supposed to be, but it has to start with each of us. And most importantly, be human and remember that the people you've been shouting at are human too. I want to talk about dreams for a little bit. I'm not talking about aspirations, but actual dreams you have while sleeping. I have a pretty active dream life, however most of it is pretty mundane. I'll dream about work or being in some situation I'm not prepared for, just the same as anyone else. However there are three instances where my dreams have been so weird, they've stuck with me for years. The first was when I was fourteen years old. I had a vivid dream of being chased through my house by a man with a shotgun. That house was not big by any stretch of the imagination so it wasn't like I could run and hide very many places. I remember I was trying to run from the hallway to the front door so I could get outside and the guy with the gun was hiding in the kitchen. As I emerged from the mouth of the hallway into the living room, he swung around into the opening from the kitchen and shot me dead in the chest. The next thing I remember is looking at my body laying dead on the floor and thinking to myself, "Well, I guess that's it then." And I woke up. I'd always heard that if you died in your dream, then you'd die for real but it seems that was not the case. Thus one urban myth was completely debunked for me. The second vivid dream memory is actually a series of dreams and they continue to this day. I tend to have them about once or twice a year and I absolutely love them. The weird thing is, they're a continuing narrative, but otherwise they're pretty mundane. They all take place in a high end outdoor mall nestled in the mountains. It seems to be in either Tennessee/North Carolina or in Oregon/Washington. I'm there with my wife, daughter, brother, sister and their families. There's a really cool putt-putt golf course that runs through the middle of the mall and in one "episode" there were go-karts racing as well. The shops are all high fashion boutiques, nice restaurants, etc. Since I'm with my family (who are some of my favorite people in the world), it feels fantastic! I always wake up from those dreams missing my brother and sister quite a bit. Then a few months or so later, I'll have another dream and it will pick up right at or near the point where the last one ended. It's a pretty strange phenomenon but it's also very welcome. Which brings me to the third dream. This one was a rough one and it's the subject of the story you can download below. This came to me in its entirety while asleep. When I woke up, I felt absolutely devastated and immediately went to my computer and started typing. Hopefully it captures the horror and emotion I felt that morning. If not, then at least I hope it gives you a little bit of a creepy feeling. Follow the link below to download it for free in the format of your choice. HOWEVER, I ask one favor from you. Once you've finished reading, please go back to Smashwords and leave a review. Be honest. If it worked for you, let me know. If it didn't I want to know that also. I look forward to your feedback. And without further delay, here you go. Enjoy!